Browse our selection of stone fireplaces for a little inspiration on what your next fireplace should be. Our wide choice of stone fireplaces can be used with gas, electric and solid fuel fires and stoves (fires and stoves sold separately). 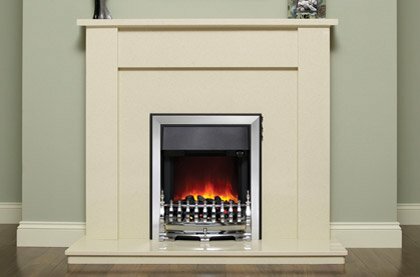 Available in limestone, marble, granite and sandstone, our stone fireplaces are supplied complete with back panels which can be used with one of our fires, or altered to accept a chamber for use with one of our stoves. Need a little inspiration for your new fireplace? Our fireplace packages will see you through, including a range of gas, electric and solid fuel packages in many various designs and combinations to inspire you. We also have a selection limestone, marble, granite and sandstone fireplace packages complete with back panels which can be used with one of our fires, or altered to accept a chamber for use with one of our stoves. Our selection of fireplace packages takes the hassle out of browsing through pages and pages of products. Alternatively, our selection of suites includes the surround, hearth, back panel and fire basket or stove (as pictured), these are the full package, just waiting to be installed to revolutionise your living room. Our natural marble fireplaces are carved from solid stone, displaying intricate natural veins and subtle colour variations. 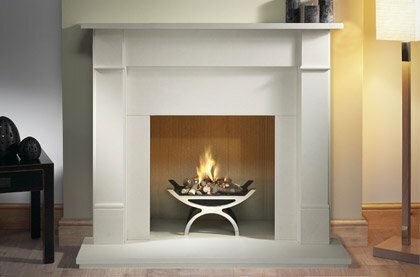 Also featured in this category are micro-marble fireplaces, these fireplaces are manufactured from crushed natural marble stone, mixed with a bonding agent which is then poured into a mould, making them much less expensive than natural marble. You can use electric, gas or solid fuel fires, or even stoves, with these fireplaces; available with a range of made to measure openings and slips. We also offer limestone surrounds, neutral in colour and constituting an unassuming background to the rest of your interior and foregrounding the fire within. This will suit almost any room and any colour scheme, contributing a natural rustic element to its surroundings. Our granite fireplaces are carved from polished black granite, displaying intricate natural veins and subtle colour variations, and come in a variety of styles and designs. Stone fireplaces were always seen as the expensive option in the mid 2000's; most manufacturers only made solid stone fireplaces that had to be carved by specialist stone masons. With the introduction of resin fireplaces things started to change. Resin stone is crushed waste stone that when ground down to a powder and mixed with a bonding agent can be poured into moulds to make a stone effect fireplaces that offered considerable cost savings - at almost half the price of a natural stone fireplace. This revolution brought about change and paved the way for the very popular micro-marble fireplaces we offer now. MDF fireplaces are the most affordable on offer, creating convincing surrounds from painted medium density fibreboard. Naturally, these fireplaces are only compatible with electric fires, but electric fires have come on in leaps and bounds in recent times, with a panoply of dazzling effects such as LCD, LED and flame mists. We defy anyone to tell the difference! All of our fireplace packages come complete with surround, hearth and either a back panel with a standard 16" x 22" opening in it. Of course, a fireplace need not be used for a fire, they can be used purely decoratively; place some ornate candles in the opening, or a large vase of flowers, or something else entirely. The options are endless! We offer a vast array of fireplace products (hence the name), including fireplace packages, suites, fires, hearths, surrounds, beams, tile sets and much, much more. If the selection is too broad for your needs, try using our filters to narrow your search criteria at the side of this page, so you can find the fireplace product that’s right for you.